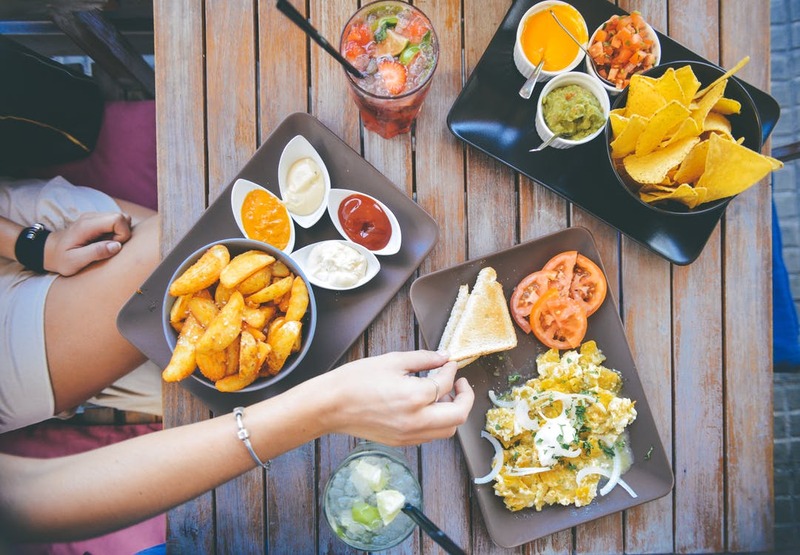 You may be somewhat surprised to find this on the top of the list, but when you live in a more rural area where UberEats and PostMates aren’t quite yet available, DoorDash is definitely the next best thing. Basically, every restaurant that is located in the area is available on the app, as well as are their full menus in most cases. This allows you to get your favorite dishes from really anywhere you would typically go to if you weren’t so busy (or feeling so lazy). There are two issues I’ve run into with this app: the first is that the food options aren’t always totally customizable. However, it is important to keep in mind that this could be an issue with the restaurants themselves who put their listings up and not DoorDash itself. The other issue is that sometimes when I’m running late for work and don’t have time to heat something up or stop at a drive-thru, there aren’t any restaurants available since there are no drivers working in the area. (So if anyone is looking for some side cash in the DeKalb, IL area and you don’t work a job with regular hours, driving for DoorDash around 9 am could be a great opportunity for you). 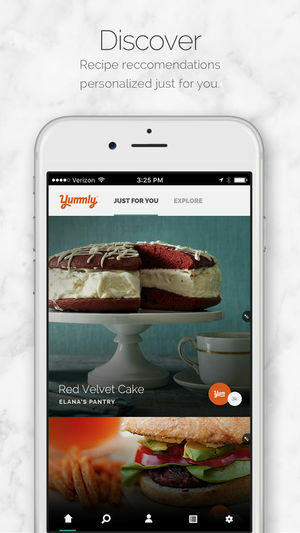 Yummly is great for those days where you aren’t feeling quite as lazy with your hunger. The app itself contains over 1 million recipes tailored to your specific taste preferences that it pulls from other popular recipe sites such as AllRecipes, Epicurious, Food52, and more. Upon opening the app for the first time, you will be prompted to login and then asked a few generic questions, which is how the app will tailor the recipes shown on your dashboard to you. The questions include what kind of foods you typically like, any allergies or diets you may be on, what foods you dislike (even with a list of the most common ones provided), and your cooking skill level. My personal favorite part of this app is that it allows you to input what foods you already have in your kitchen, and then it provides you with tailored recipes to use those things that you already have. This is the best because it ends up saving you another trip to the dreaded grocery store. Plus, if you end up using a recipe off of the app that you really liked, you can give it a “yum” and the app will provide you with more recipes that are similar in style. Another great feature about Yummly is that you can build your grocery list in the app. Each ingredient listed in a recipe has a little plus sign next to it that allows you to quickly and easily add it to your shopping list. The app then organizes the listed ingredients by the department in the store, which makes for a super easy shopping experience. Also, for those of you who do meal planning, this makes it a total breeze! Somewhat similar to Yummly, but still stands out on its own, Tasty is yet another amazing app for finding great recipes. The reason Tasty stands out is that this app is based around its step-by-step videos which make all of the recipes look incredibly easy (which most of them actually are). The videos are made with excellent quality and the end product in them definitely always look better than anything that comes out of my kitchen, which makes the app more entertaining than anything. Upon opening for the first time, you’re prompted to log in. Then, unlike many other food apps, the only question you are asked is if you’re a vegetarian (which if you select yes, will filter out all recipes involving meat). This is great as you can get to browsing recipes faster, but it makes the dashboard much less tailored to your personal tastes than Yummly. Tasty also contains a “guides” section, which is basically just food blog articles. This isn’t necessarily my most-used part of the app, but it does have some really useful articles about eating healthier, different uses for different foods, and tips & tricks for the kitchen that can be totally time-saving. The only real problem I face with this app is that I get distracted very easily. Having it be video oriented, I feel like I hardly end up cooking anything off of it because I just end up sinking into my couch watching the videos and thinking “oh that looks good, I should make that” but then I just tap another video and hardly ever do any actual cooking. An app that doesn’t get nearly as much use on my phone as it should is My Fitness Pal. This app is brought to you by the popular activewear company Under Armour and is great for those of you who want to watch your caloric intake and stick to a diet. Upon opening the app for the first time, it will ask you to log in, and then ask you some general questions. It asks you questions such as what your weight goals are (lose, maintain, gain), how much you want to lose/gain overall, at what rate you want to lose/gain weight, your activity level, and your current stats (height, weight, etc.). Once you finish filling out the general questions, you are brought to the main app dashboard. The main component of the dashboard I find myself in most frequently is the “food diary.” The best part about the food diary is that it is equipped with a search bar that has nearly everything, and there is even a barcode scanner. The barcode scanner has come in handy for me for those mornings where I’m running late and end up pulling a snack out of my desk drawer. The diary itself is super organized and shows you what your caloric intakes were for breakfast, lunch, dinner, and even snacks. 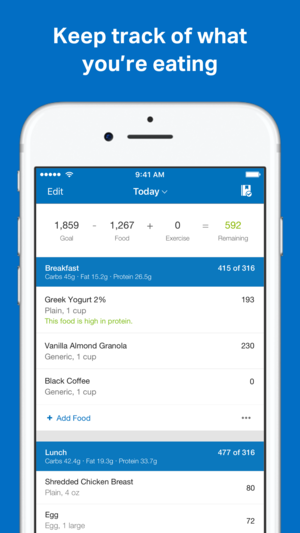 The app also has a “progress tracker,” so you can see physically see the steps you are taking towards your goals. The only downside I have found to this app is that it definitely takes consistency. For every meal you eat, you should be opening the app and inputting it to ensure you are staying on track with your goals. For someone with a very busy, fast-paced lifestyle, this isn’t always the easiest. We all eat food, and we all have smartphones, so why not take advantage of both? These apps are around just for that. Use them to make your busy life just a little bit easier! Do you have any food apps that you absolutely love? Let us know what you love about them by leaving us a comment on Facebook or tweeting us.